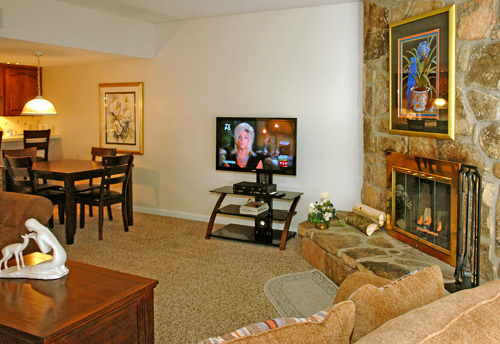 Holly Ridge Condos are located in Gatlinburg off of Baskins Creek Road. The 2 bedroom/2 bath units are fully furnished including all linens, silverware, washer & dryer, and dishwasher and comes with basic cable, a VCR and/or DVD/VCR combo. Each unit also has a wood burning fireplace and wood is provided in season. Units can accommodate up to 6 guests with a queen size sofa sleeper. All units are pool side or overlooking the pool. Wood burning fireplaces with wood supplied. 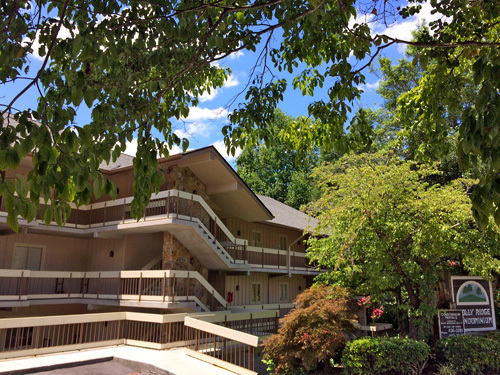 Less than a 10-minute walk to downtown Gatlinburg. Suggest taking the trolley when walking back at night. Must be 21 years of age to check-in. Holly Ridge Condos are located in Gatlinburg off of Baskins Creek Road at traffic light #6. These 2 bedroom/2 bath units are fully furnished including all linens, silverware, washer and dryer, and dishwasher. No maid service is provided. Enjoy our new seasonal salt water pool. Each unit comes with basic cable and a VCR and/or DVD/VCR combo. Each unit also has a wood burning fireplace and wood is provided in season. These units can accommodate up to 6 guests with a queen size sofa sleeper in each unit. When staying at Holly Ridge, guests must check-in at our Bluff Mountain Realty office located in Pigeon Forge, between Traffic Lights 0 & 1. How many units are available at Holly Ridge Condominiums? There are two condominiums – each have 2 bedroom/2 bath that sleeps up to 6. How many floors are the condos or buildings? The Condo itself is one level; The building has 4 floors; all units require steps to reach the condo; no elevators. Is there a restaurant on-site? A lounge or café? Yes, guests must be 21 years of age to check-in. Are there any resort fees? Cribs and rollaways are not available. There are two areas to park – the front of the building and by the pool. There is a two car maximum per guest. Are the condos handicap accessible? No, our condos are not handicap accessible.